We begin our final article on Newark's historically important clocks with an inventory of the major outdoor clocks in Newark following the end of World War II. This inventory reveals a substantial collection of timepieces for keeping local inhabitants punctual. Clocks and watches had been invented by the time of Newark's settlement and were not really beyond the financial means of most, but they were relatively few and far between, for this was a farming community. As a result there were many public clocks, mostly outdoors. Howard Garis, known to many older Newarkers as author of the Uncle Wiggly tales in the Newark News, did a walking tour and inventory of the clocks in the neighborhood of the Four Corners. At Holzheimer's, a well-known drug store at the northwest corner of Broad and Market streets, which was a favorite spot not only for filling prescriptions but for its celebrated chocolate sodas, there was a fine clock outside. When Garis checked its accuracy on May 20, 1946, he found it 3 minutes slow. Just down the street was perhaps the most famous clock in commercial Newark, the Bamberger clock which protruded over the Halsey and Market Street entrance. This well-loved clock was encased in a metal frame with Arabic numerals which could be seen by shoppers coming to the store from the east or west along Market Street. It was so well known to local shoppers and downtown business people that the expression 'See you under the Bamberger clock' was as much a phrase here in Newark as 'Meet me by the lions at the New York Public Library' was in Manhattan. The tradition was kept alive in Bamberger's prize magazine Charm which even ran advertisements mentioning the clock's growing mythology. In Garis' horological inventory he pointed to the clocks of the three downtown churches of North Reformed, Trinity and Old First. And in an old-fashioned furniture store at Green Street near City Hall, there was a large illuminating sign including a second-story clock which was not even running. Garis pointed out in 1946 that there were no clocks in the city government complex including City Hall, the Police Department and the Board of Education. However, in the 19th century Newark Fire Headquarters on the northeast corner of Halsey and Academy streets there was a clock which only struck the 9 hour each evening. So accurate was its peal that it was used by many to set their watches as well as serving as a curfew for city youngsters. Up from City Hall, between William and Market streets, on the west side of Broad Street, was a jewelry store which displayed an accurate, well-kept clock, but above on the store's second floor was a profusion of 'unloved clocks, ' probably none of which conveyed the correct hour. At the Four Corners was the famous 10-foot stanchion clock, and down the street and around the corner was another clock in the building opposite the entrance to the Broad Street city subway station. The old Center Market, located in the middle of what is now Raymond Boulevard was supposed to have had a clock, but it was never installed because of faulty construction of the tower. At the Essex County Egyptian-style courthouse, built in 1837, was the city sundial. It disappeared with the demolition of the courthouse for the new Cass Gilbert structure, which stands there today. Among the most important 'public' clocks in Newark, the Broad Street great church tower clocks are the grandest and perhaps most important. They have served Newarkers in several cases for more than two centuries and are still the old reliable timepieces gracing Broad Street. Trinity/St. Philip's Cathedral clock is among the oldest. 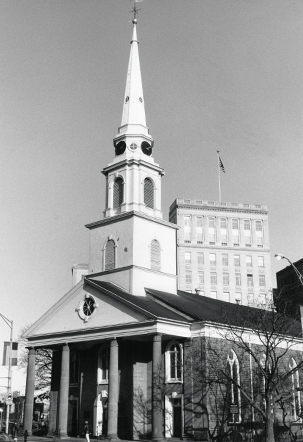 When Trinity Church was built in 1743, there was a steeple clock installed, and it is seen in early paintings and drawings of the building. Following the Revolutionary War, when the church was largely reconstructed in 1810 after damages inflicted upon it by the Continental Army troops, another clock was put into place. Today's clock has four faces of gold numerals on a black background. The handsome Sir Christopher Wren-type steeple is composed of three units or building blocks. The first two blocks contain louvered openings, the third block is a smaller octagonal-shaped unit with the four clock faces separated by small round windows, and a tall white steeple caps the Georgian- styled tower. When comparing the general overall feeling of the structure to the North Reformed and Old First church buildings, Trinity/St. Philip's tower is almost delicate. Its freshly painted white architectural elements and the size of the clock faces leave the viewer with an impression of refinement and serenity. A large clock was installed at Old First soon after the 'new' building was completed and opened on January 1, 1791, and it is unlikely there were clocks in either of the church's earlier structures. As you probably remember, the wonderful Georgian-styled church was begun before the Revolutionary War, and much of the carved interior wainscoting was allegedly hidden in the Newark Meadows for safekeeping. Most sources agree that the 1791 building had a clock soon after its doors opened, which lasted until the mid-1920s. Its replacement came in 1924, and it has been guiding Newarkers ever since. In 1961 Richard Westwood, then 59, the church's clock custodian, climbed its 87 steep stairs into the steeple regularly to adjust the clock's machinery. When interviewed in the Newark News in June 1961, 'he pointed his finger into the grease works (saying) that spider gear is worn and keeps slipping. Been that way for a month. You should hear the complaints.' Well, as I walked down Broad Street last Sunday passing the building, my general impression of it standing across the street, up close to the tower, at the front door and in the driveway leading behind the church, was one of power and grandeur. The massive 18th century sandstone structure holds its own with the adjoining early 20th century Cass Gilbert-designed building. Its strong rusticated sandstone walls, neatly balanced Georgian facade, palladian windows and soaring tower topped by a great steeple, all give the impression of imposing beauty. Compare the front of Old First with Trinity/St. Philips. The former professes boldness, the latter grace. In fact, looking directly at the front of Old First your impression is of a massive walled tower, and when you look at Trinity you see a stack of architectural hat boxes neatly piled atop each other. At Old First the tower is dominated by a very large four-sided clock, which is unquestionably the city's largest, and placed on an architectural stage which cannot be ignored by even the most casual observer. Old First's clock is intended to dominate, not blend into the background, and in spite of its size and age, it has one of the best performance records in town.